How do I become a Steward of the parish? Stewardship in the Orthodox Church begins at baptism (Chrismation for some) and continues throughout our life. We are united with Christ through the sacraments, or mysteries, of the Church and through our faithful offering of our entire selves to Jesus Christ. Our Archdiocese requires each parish to distinguish between voting stewards and non-voting stewards. A voting steward is over 18 years of age and turns in a signed stewardship commitment card, committing a portion of time, talent, and treasure to the Church. The Archdiocese also requires the voting steward to remain current through the year on their commitments. Keep in mind that true stewardship in the Body of Christ involves living according to His word and within His Church. As with any budget, it helps to know what we can expect so we can plan our expenditures. Pledges let us know what you can commit. Also keep in mind that your stewardship amount is kept in the strictest of confidence. However, we do compile the amounts anticipated to better plan our budget. During the course of a year, people’s circumstances change. Your stewardship is valued because it is made out of your love for God and His Church. Please do not be concerned if you are unable to meet your stewardship commitment – we are glad you are a part of this parish. God asks only that you enter into a good-faith commitment, not a legal contract. You can make changes brought about by new circumstances (positive or negative) simply by contacting the Church office. The Annual Stewardship Campaign is a parish-wide process, beginning in November, to encourage regular participation in parish life through financial commitment to Christ and His Church. In addition, we pray for commitment of time and talents from every steward, including children. There are multiple ways for all ages to get involved in parish life, and involvement will only deepen one’s bond with Christ. Stewardship commitments are offered on a calendar year basis from January to December. When does the Annual Stewardship Campaign end? Because true stewardship is a way of life, there is, strictly speaking, never a time of year when it is ignored or forgotten. However, our goal is to have every current steward-household return a pledge card by March 31 and commit to regular, monthly payments of that pledge throughout the year. 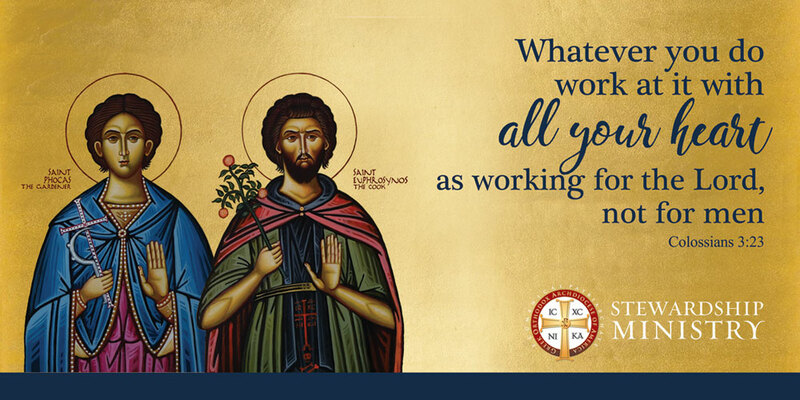 Why does the Orthodox Church encourage annual stewardship commitments from its stewards? The philosophy of the Orthodox Church is to take as much of the daily focus off finances as possible. By making an annual commitment, you provide the security that operating expenses of the Church will be underwritten through stewardship. This will allow us to move forward with our real work of being disciples of Christ, which includes not only evangelization and community service, but also the education, nurturance, and support of our own parish community. What does stewardship help pay for? Our Church is like any other parish. Children are baptized and married here. Each Sunday your Church presents a rich liturgical experience. We offer ministries that include Sunday School, Youth programs, adult education, and more. In addition, we have expenses, including: priest and staff salaries, payroll taxes, and health insurance; facility utilities, maintenance, and insurance; administrative expenses such as office supplies, computers, printers, and copiers; and informational publications such as our Kimisis Journal and mailings. These are all expenses you would expect a thriving, growing parish to incur in getting its message out to the world. What was the operating budget this year? It costs approximately $1300 per day to operate Kimisis. Your Stewardship supports Kimisis. How much stewardship is needed to fund our operating expenses? With several hundred households supporting a substantial budget, average donations do not tell the whole story. Some may be able to give more, others less. Our focus should be on what each of us can afford as our fair share. What is the best way to fulfill my stewardship pledge? Stewardship is most appropriately understood as an obligation not unlike utilities and rent. So we encourage you to make regular, monthly payments at the same time you sit down to pay your other bills. The Church has made fulfilling your pledge so easy with a variety of payment methods: credit card, automatic bank withdrawal, payroll deduction, cash, or check. Offering envelopes are available on request from the Church Office. What about the time and talents portion of my commitment? There are a variety of ministries geared toward all age levels. Sunday School, adult Bible studies, Choir, Philoptochos, GOYA, food pantry, and shut-in visitation, to name a few. But, if you have a particular talent or interest not currently represented in one of our programs, we’d love to hear about it. Please contact our Church Office with questions. Is my commitment that important? Absolutely. We all want the Church to be there for us. If our Orthodox community is to remain healthy, we each need to contribute our fair share, understanding that the expenses and work of the Church go on whether or not we are in attendance. More importantly, demonstrating thanksgiving to God in a concrete way is the best way of going through life with an “attitude of gratitude” for all that He has given us. Everyone has the opportunity to simplify their gift-giving process. Stewards can donate online with a credit card or debit to their bank savings or checking account. Simply go to www.kimisis.com and click on GIVE ONLINE. Follow instructions to set up a private account with your email address and select the Stewardship Fund. Several people have started using the service and have found it safe, convenient, and effective. Some give a one-time gift in full; others select recurring options for monthly giving. You decide what works best for you. You may also donate stocks to fulfill your commitment. Contact our Treasurer, or the Church Secretary, 732-739-1515 for more information. STEWARDSHIP COMMITMENT IS REQUIRED TO RUN FOR PARISH COUNCIL OR TO VOTE. To be considered a steward in good standing and be able run for or vote in the Parish Council Elections or at the General Assembly, your Stewardship commitment must have been 75% completed by October 31. Please send your check to the Church Office or go online to make a secure credit card or debit donation. UPR: Section 4: A parishioner in good standing and duly enrolled in the Parish Record but delinquent in his or her Parish stewardship obligations for the current year may vote in the election by meeting his or her stewardship obligation prior to the election, unless Parish Bylaws have established alternate deadlines in this regard. If a Parishioner is delinquent for more than the current calendar year, he or she may vote in the Parish Council elections only if he or she has met his or her unfulfilled stewardship financial obligations at least thirty (30) days prior to the date of the elections. Kimisis By-Laws: To be considered a steward in good standing and be able run for or vote in the Parish Council Elections or at the General Assembly, your Stewardship commitment must be 75% completed by October 31. A Stewardship Commitment form must be submitted by March 31 of the current year. UPR: Section 5: A new parishioner of the Parish may vote in the election if he/she has become a member in good standing at least three (3) months prior thereto.